When Is A Bike Rack Not A Bike Rack? The answer my friends is when it is installed as a barrier. I found myself by St. Augustine Rd. and University Blvd. the other day needing to swing into a Publix to pick some stuff up. Luckily there was a big brand new one right there on the corner. 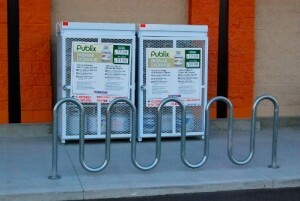 I parked and smiled as I noticed the new shiny potato-masher style bike rack right up front close to the entrance of the store. I noted in my head that I thought it was placed a tad to close to curb however. It wasn’t until I returned outside that it hit me why the bike rack was placed where it is. It was never meant to used as bike rack. It’s sole purpose is to act as barrier for the propane gas canisters located behind it. Looking at the picture above you can see what I am talking about. If a cyclist were to use the rack as designed, part of the bike would overhang into the roadway, which could lead to damage of the bike. If a cyclist were to lock his/her bike so as not to overhang the curb, it would then completely block the sidewalk while also preventing access to the propane canisters. As you can see from the picture there are only two items located along this sidewalk, the propane display and the bike rack. I might also point out it is a very long sidewalk by storefront standards as there was another 25-30 feet of it behind me and not pictured here. So why does Publix place a bike rack right in front of a propane display in an unusable state if not solely to act as a barrier and protection from automobiles? When I click through to read the full article I don’t see the pictures you reference. Sorry about that. It should be fixed! That’s called smart programming. It’s serving multiple purposes. Why can’t a bike rack that has bikes on it possibly 10 percent of the day also act as a ballister? I think that’s a great idea.